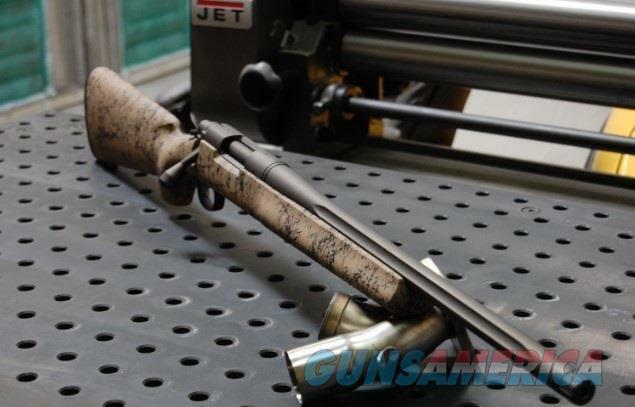 Description: New in box Remington 700 5R .308 20" fluted threaded barrel with an X-Werks Midnight Bronze finish! Remington Firearms 85196 700 5-R Gen 2 Bolt 308 Winchester/7.62 NATO 20" 4+1 Synthetic HS Precision Sand w/Black Web Stk Black Cerakote The Remington 700 5-R Gen2 sets the benchmark for accuracy and durability. Much like M-24, the barrel is cold hammer forged and features 5-R rifling. The 5R rifling profile increases barrel life expectancy, accuracy and creates less fouling and bullet deformation over time. It has an action and barrel with a black cerakote finish, H.S. Precision composite stock, dual front swivel stud system, and a X-Mark Pro adjustable trigger. his model features a 20" threaded barrel chambered in 308/7.62 NATO. SPECIFICATIONS: Mfg Item Num: 85196 Category: RIFLES CENTERFIRE Action :Bolt Caliber :308 Winchester/7.62 NATO Barrel Length :20" Capacity :4+1 Trigger :X-Mark Pro Safety : OAL :39.75" Weight :8.31 lbs Stock Description :Synthetic HS Precision Sand w/Black Web Metal Finish :X-Werks Midnight Bronze Twist :1:11.25" Barrel Description :Stainless Steel Muzzle :Threaded Receiver Material :Stainless Steel Sights :None Barrel Length Range :20.00" to 21.99" Weight Range :8.00 lbs to 8.99 lbs Hand :Right Stock Finish Group :Synthetic.